Am I asking too much, or does my partner need to step it up? It’s a very discouraging and frustrating place to be in — for both of you. Your wants and desires are likely beautiful and valid. We simply want to set you up for optimal success by offering 7 quick tips that can help you break free from the rut of resentment and create more opportunities to feel more connected and supported as you co-create a mutually fulfilling partnership! 1. Set your beloved up for success. It is possible you have unintentionally trained your beloved not to contribute more in this area by criticizing whatever efforts they have made in the past (i.e. they feel like they can never get it right or do enough to make you happy) or by asking them and then doing it yourself before they can get to it. It’s so important to create a positive space for your partner to contribute and for them to succeed at whatever it is. Make your requests as loving and positive as possible (i.e. avoid shaming, criticizing, or guilting your beloved into helping) and then shower them with appreciation for however they contribute (yes, even if it’s not “perfect.”). Remember that PRAISE is one of the most motivating things there is. On the contrary, criticism is one of the least inspiring. When we keep score, we are usually so focused on what the other person is going to give back (or isn’t giving back) that we miss out on the intrinsic joy of giving and the many benefits that come from simply serving for the love of serving. Research shows that kindness and generosity can be some of the fastest pathways to happiness. However, the moment we start looking for what someone is going to give us back, we inhibit our joy. Also, when it comes to your beloved being the recipient, it’s certainly not as enjoyable to receive something from you if there are big strings attached. 3. Focus on where your beloved DOES contribute. There are so many different areas and ways we can contribute to one another’s lives. Some ways are ACTIVE or more quantifiable (making money, doing chores, running errands, etc.) and others are ways of BEING and more qualifiable (flexible, kind, understanding, patient, positive, nurturing, fun, etc.). 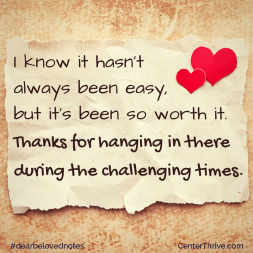 It can be easy to fixate on the ways our partner doesn’t show up. When we do that, we miss out on all the ways they do show up. What are some things your sweetheart brings to the relationship that you may be overlooking or taking for granted? As always, gratitude is one of the fastest ways we can shift our entire perspective and return to our hearts. 4. What does your beloved want more of from you? If you were to check in with your partner, how fulfilled do they feel in your relationship? Chances are, if your needs are unmet, theirs are too. There is also a good chance that what they want more of may be things you don’t necessarily excel in giving. Perhaps they want more physical affection, more fun and adventure together, more deep breaths and presence with one another, more kindness and laughter, and so on. In what ways are you not being their perfect partner? Keeping ourselves aware of our own imperfections (in a gentle and self-compassionate way! ), can be really valuable when it comes to appreciating our beloved. In thriving relationships, we give each other permission to be human and focus on each other’s strengths and best intentions. 5. Do things because they are important to YOU and as an act of self-love. There are certain things you are doing more of that probably come quite naturally to you (probably more naturally than they do for your beloved). When you were single, they may have been things you didn’t even mind doing. Suddenly, there is a dark cloud over these activities because you are doing them resentfully and not feeling mutually supported. Try returning to doing these activities because they are important to you, because you want them done, because they increase your quality of life, because they bring you joy. 6. Try a different approach. When something isn’t working, we adorable humans sometimes try the same strategy even harder. For example, perhaps nagging isn’t working – so you then nag even more. Which, of course, then works even less. Try shifting your tone, approach, and words. Make more loving, encouraging, appreciative, playful requests while you’re already feeling connected – rather than telling your partner all the things they are doing wrong, guilting them, and making demands. We realize this tip may or may not be feasible for you. However, there are some things you may initially think you don’t have money for, and it’s actually just about re-prioritizing how you spend your money. Hire someone to help clean the house, tend to the yard, make healthy meals, watch your kids, run errands, and so on. Research shows that the happiness and quality of our relationships has an exponentially higher influence on our life satisfaction than nearly anything else. That money you spend on the new pair of shoes? Fleeting happiness. 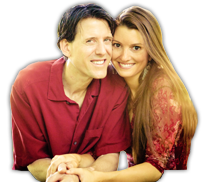 The investment you make in creating a happier relationship? Lasting happiness. We hope these little tips are helpful! Of course, we want to also recognize that your partner might truly need to step it up! However, these 7 shifts in your mindset and approach can make a big difference when it comes to your part in helping your sweetheart do their part in co-creating your most wonderful life! If you are hungry for more ______________ and feel stuck when it comes to your partner showing up for you in the ways you long for, we are fully here to help! It is our passion to help couples create vibrant relationships where both of your needs and desires are valued and met – and in ways that work wonderfully for both of you. You can learn more about our coaching and counseling HERE and can sign up for a FREE 20-minute consultation at anytime right HERE. Also, be sure to save the date for our next Thrive in Love couples retreat happening the weekend of September 30-October 1 in Bloomington, IN. 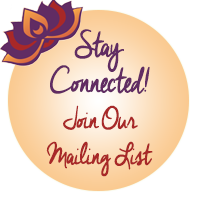 You can register anytime for that and learn more HERE. Simply know we are here for you in any way we can be of loving service! We’re wishing you an abundance of blessings always! Springtime is surely an amazing time to breathe new vitality and intention into your love. May it be so for you! 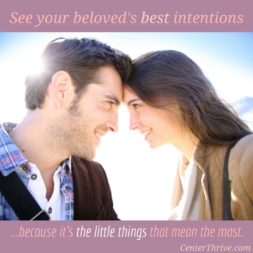 See your beloved’s best intentions.